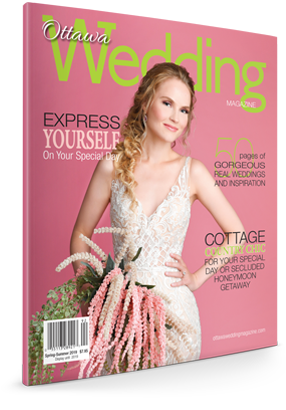 Small, intimate weddings are gaining popularity as couples seek to celebrate in a unique style but that doesn’t mean colour is taking a back seat in achieving that special wedding vision for this year’s bride. Tying the knot means tying together all the loose ends needed to perfectly pair your wedding theme to everything from wedding colours, food design, dessert trends and table settings. The possibilities are endless for a wedding that captures the easygoing, light and refreshing vibes of the season. Let’s look at some of the fun and trendy ways couples will ‘wow’ their guests this spring and summer. The warm weather seasons are all about living life to the fullest. Your wedding’s colour scheme should reflect the tremendous joy, happiness and good energy of your special day. There is a trend toward bold, vivacious colours that will add just the right pop of colour against any wedding gown or bridesmaid dress. The popular colours for 2018 are pearlescent hues and jewel tones. ink vibrant reds and pinks to add a splash of rich, lively colour to your wedding vision or go for a sunnier yellow or orange. Metallic, iridescent shades always add a feeling of luxury. Small, intimate weddings are gaining popularity as couples seek to celebrate and focus on connecting with the people who have helped nurture their relationship. This also allows the couple to spend more money on aspects of the wedding that are important to them, whether it’s the venue, food or decor. A smaller head count also opens up the possibility for a greater selection of interesting outdoor venues. There is a move away from elaborate wedding cakes. As long as there’s a small cake for the bride and groom to cut (if you choose to do that tradition), there are so many sugary possibilities to put an exclamation mark on your wedding meal. Couples are choosing dessert tables that enable the guests to sample a plethora of sweets. 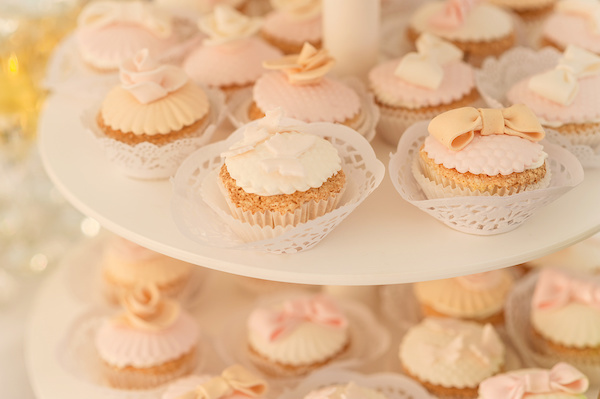 Instead of a wedding cake with tiers of different flavours, go for cupcakes in a variety of flavours. Give your caterers your wedding colours and oral choices and see what decoration they come up with; caterers are having fun giving the newlyweds a gorgeous surprise they didn’t expect when the cake is brought out. The rustic boho theme is still popular, especially for outdoor summer weddings. Simplified elegance is an always classic wedding vision. Shades of whites and pearlescent hues with pops of colour will bring a light, airy feel to your wedding. Mix rustic, natural pieces and oral patterns with the subtle glam of glass vases and metallic touches for an on-trend wedding aesthetic. Vintage vibes never get old. Incorporate family heirlooms and antiques to add some nostalgia to your décor.